Snow and freezing overnight temperatures have caused havoc on the roads in Cornwall. 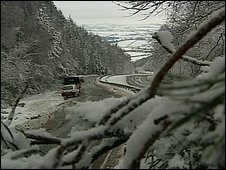 The extreme weather led to parts of the A30 being closed between Bodmin and Okehampton, as well as the A386 between Sourton Cross and Tavistock. 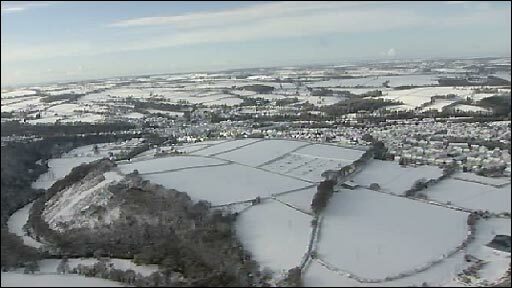 There was also snow in the Launceston, Bude and Camelford areas. Some travellers had to spend the night in community centres and town halls after being stranded because of the treacherous road conditions. Snow reached levels of about 25cm (10ins) in the Launceston area. Parts of the A38 and A39 were also closed for some time. They were later re-opened. Firefighters had difficulty getting to a house fire in the south east of the county because of what the brigade said were "atrocious" road conditions. Two appliances from Liskeard were sent to Plushabridge, near Upton Cross, after a chimney fire broke out in a cottage at about 1030 GMT. But only one engine was able to get to the building because it had four-wheel drive. The fire was extinguished. Western Power said 23 properties were left without electricity across the county. It said they were largely individual problems and could take some time to fix. About 50 schools and colleges were closed across the county. Smiths Coaches to Cornwall College in St Austell also cancelled its service because of the snow and First announced it was not running buses in the Torpoint, Liskeard and Seaton areas. Cornwall County Council said that road temperatures were set to fall below zero, which would result in the wet roads becoming icy and slippery. It said that its gritting lorries would be out again throughout the night. Cornwall Highways Duty Coordinator Jeremy Edwards said: "We are doing all we can in advance of this to help keep the roads passable, but please exercise common sense and drive with extreme caution. "Never assume a road has been salted and please slow down". Police advised people not to drive in affected areas overnight unless it was critical.